midwestern girl transplanted to the east coast. newlywed. wanderer. For our last full day in Ireland on September 26th, we woke up in Kenmare and got packed. 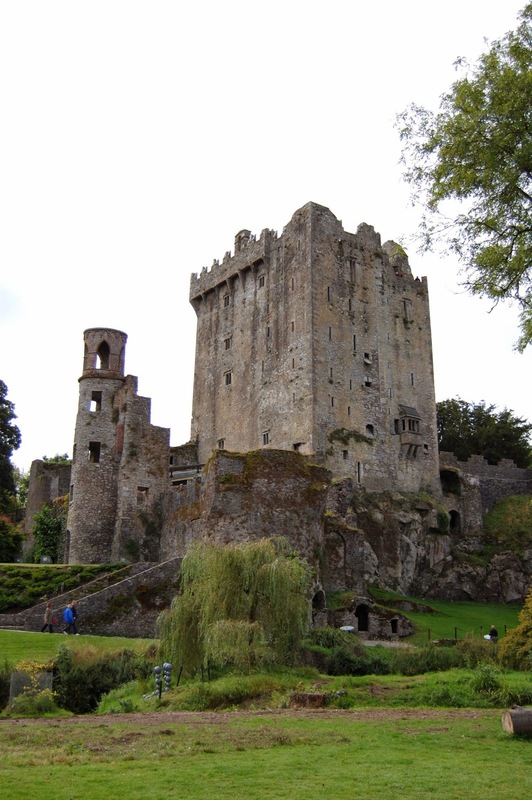 We headed toward Blarney to visit Blarney Castle and kiss the Blarney Stone. We looked at the tower and dungeons and then climbed up to the top in a line. The steps were steep and winding, making it a bit scary at times. Once at the top, we were all able to kiss the blarney stone. It just seemed like something you had to do while there. After that, we walked out to the Poison Garden below. We had a light lunch at a cafe there and bought a few more souvenirs before leaving. Karen and Jim dropped us off at our hotel by the airport in Cork. We said our goodbyes, and they headed back to Dublin. We checked into the hotel and then arranged to meet Michael and Frances later. Hubby and I took a bus to the city centre and then walked along the river to Saint Patrick's Street. We walked around doing some shopping and looking at the shops. We had dinner at The Thomand and then walked back down to Merchant's Quay. Michael and Frances came to pick us up and drove us back to the hotel. They joined us for drinks in the bar, and we had nice conversation. After they left, we headed to bed so that we could get up in the morning and fly home. It was a wonderful two weeks, from beginning to end. After waking up on September 25th, we decided to go to the local Super Value. We had to get around construction, but we made it to the grocery store and bought laundry detergent and a few other items. After eating a low key breakfast back at the apartment, we made our way toward the townhouse that Wendy was renting. We got lost a bit on the way there, as it was just slightly out of town, but it's a small place, so we eventually found the right road. We had tea and played with the two stray cats outside. We headed out to the old Kenmare burial grounds with Wendy. It's a beautiful place, and we walked around looking for our family. We were able to find the graves of our great grandparents and 2nd great grandparents, among other family members. It's just an incredibly beautiful, peaceful place. After walking around the cemetery, we went down to look at Kenmare Bay. After looking out at the bay, we headed back to the apartment and then did some shopping. We bought knits and other souvenirs. Karla and Jimmy then arrived before dinner, so we met up with them. We had arranged to meet the whole family at O'Donnabhain's for dinner. Wendy arrived with cousins Michael and Julien, and their spouses Frances and Mick. They brought Aunt Betty with them, who ate a few bites from our plates. We were all so glad that she came out for a while, especially since she passed last month. Michael and Julien took Aunt Betty home after dinner, and then came back. We had drinks at a couple of the pubs in town with the whole family and listened to live music. It was a wonderful evening, and I think it was the highlight of our trip to meet up with the family. 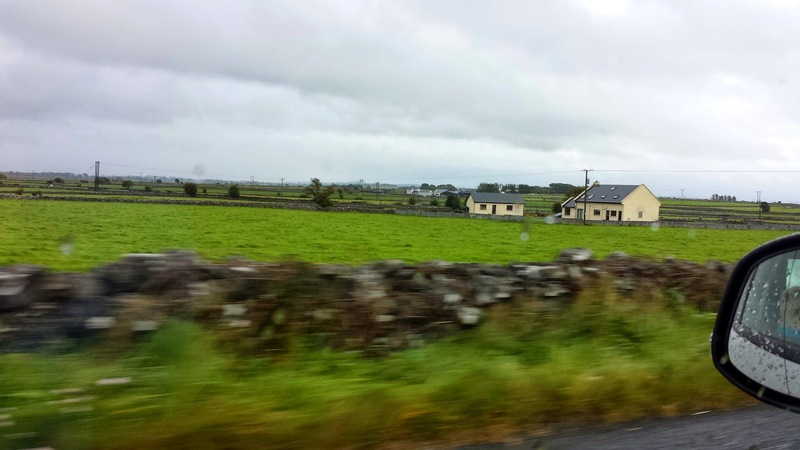 On the morning of September 24th, we got checked out of our hotel in Limerick and headed toward Kenmare. We arrived in the late morning and met our cousin Wendy at Davitt's for lunch. Following lunch, we did some shopping. There was a market going on in the town. 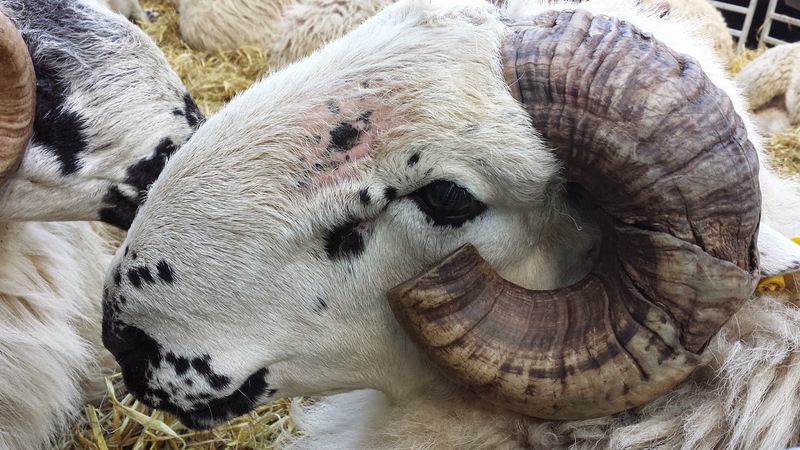 We saw some sheep in a pen. After shopping, we walked over to Holy Cross Church, which is where our grandmother, and Wendy's mother, would have gone to church and school. It's a beautiful church on the inside and outside, and it was wonderful to see where our family lived, and went to church/school. The history of the Poor Clare Convent was also of interest. After exploring the church, we walked down to Springwell Cottage, which is the home where our family lived. There is an addition on the house now that wasn't there when the family lived in it. A short distance away is Cromwell's Bridge. 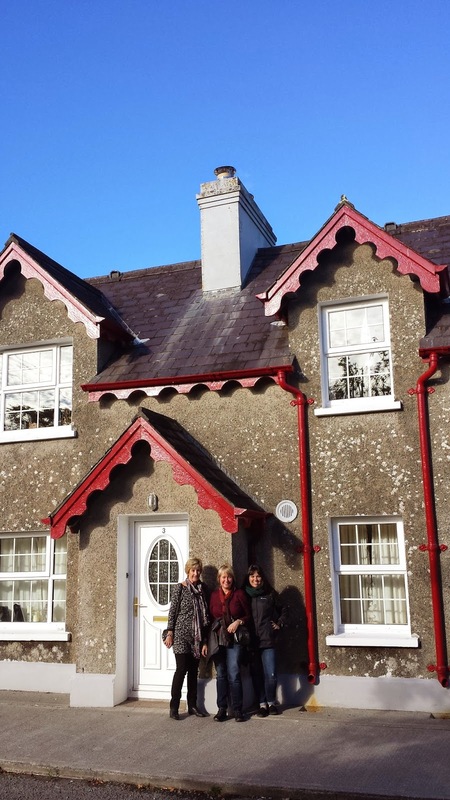 As Kenmare is a small town, we were able to walk around and see other houses where members of our family lived. We saw a stone circle on our walk as well. After a great walk around town, we ended up back on Henry Street and settled into our apartment. It was a great, modern place right in the center of the town square. It was perfect for the four of us to share, as there were two bedrooms and bathrooms. We ate at the Coachman's across the street. Wendy came over to meet us for drinks and live music. Our plan for September 23rd was mostly driving. The two places we wanted to visit on this trip were Donegal and Kerry, which are in the far north and far south of the country. So we spent most of the day driving, and made it from Letterkenny (Donegal) to Limerick for the evening. We woke up and enjoyed the full Irish at Gallagher's Hotel, got packed up, and then did a bit more shopping before heading out. Included in our purchases were some cheap wheeled duffles to bring home all of our goodies, as we had all only brought along carry-on bags on the way out. We headed out of town and began to drive south. We first stopped for a few minutes at a town called Mullaghmore in Sligo to see the beach. It was pretty, but very cold and pelting rain. I think we lucked out on the weather again, as this was the only day it really rained all day, and it was our driving day anyway. It was a nice scene, with boats and traps, but we could only stand in the cold rain for a few minutes (the umbrellas weren't much help because of the cold and the wind). A little further down the road, we stopped for gas and bought road atlases. These are very helpful when you don't have a GPS. We enjoyed the Irish scenery, and ended up making pb&j sandwiches to eat in the car for lunch, with our Gallagher's bread. 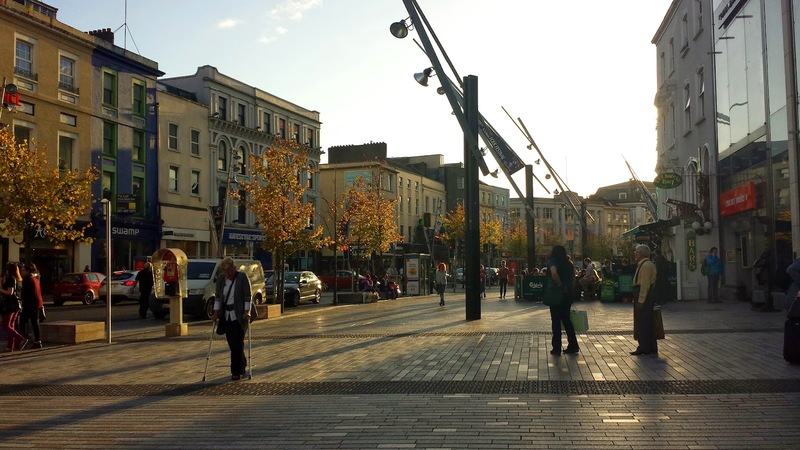 We drove down through Sligo, Galway, Clare, and finally arrived in Limerick City around 6pm. We checked into our hotel, which was the same place that hubby and I stayed at on our last trip. After getting settled into our rooms, we went out to explore the town a bit. We did some shopping, and then walked down to The Locke Bar for dinner, which is a place the hubby and I enjoyed twice on our last trip, and is close to the hotel. There was a violin/guitar duo playing trad music, so we enjoyed the atmosphere with our dinners before heading to bed. We could have gotten a free glass of wine at the hotel, but we were all too tired to take advantage. As this has become a travel blog, I have just been going through my photos of a trip we took to Italy earlier this month, and I realized that I never finished logging the Ireland trip last September. I'm going to finish this up first. Luckily, I jotted down notes in a notebook so that I can remember what we did each day (and I'm mostly finished with the two-week trip anyway). On September 22nd, we met Karen and Jim downstairs for the full Irish breakfast. This was served for €5, which we thought was a great deal compared to Dublin. We ate some combination of fried eggs, sausage, pudding (white only for me), beans, mushrooms, and porridge. Following breakfast, we did some shopping along the main street in Letterkenny. 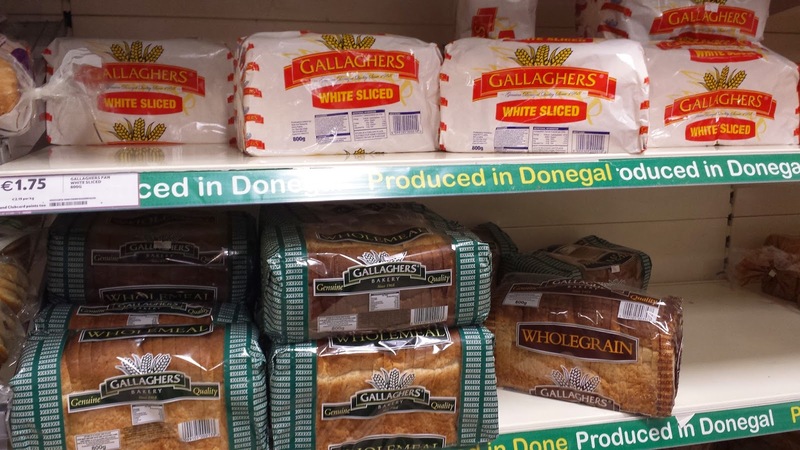 This included souvenirs for Donegal from the big game. We then decided to explore some of the northern coast and the new Wild Atlantic Way. We drove toward Fanad Head peninsula. This included winding roads up toward the lighthouse and, as always in Ireland, pretty countryside. We stopped to take in some of the views and came across a very friendly dog. We also saw some horses by the sea. It was just sunny and beautiful and perfect. There was a point here where there was a great view of the lighthouse in the distance, and the pretty scenery along the coast. It was just a short drive further along to the lighthouse. It was quiet and peaceful there. We drove a short way further toward Ballyhiernan Bay and found a beach. It was very secluded and peaceful. It sort of reminded me of the imagery exercises that you can do to calm yourself, where you picture a serene scene of some sort. There were beautiful views of the North Atlantic. Further along, we found another sandy beach and views on Ballyhiernan Bay. We had some confusion finding the way back to Letterkenny, but were able to find enough road signs to make it. By the time we arrived back, it was almost 5pm, and we hadn't eaten since breakfast. We ate at Inis Meain, the restaurant inside Gallagher's Hotel. We seemed to be the only ones eating that early, so it was quiet and there were nice views of the town. We all ordered burgers - mine topped with bacon, aged cheddar, lettuce, and sauteed onions. After eating, we walked to the old cathedral and graveyard. We walked through and looked at all the gravestones. We even saw a rainbow! We were able to locate some Gallaghers buried there. It was getting fairly dark by this point, so we walked down to Tesco. We stopped at Monarch Casino along the way so that Karen could say she'd tried a slot machine in Ireland. 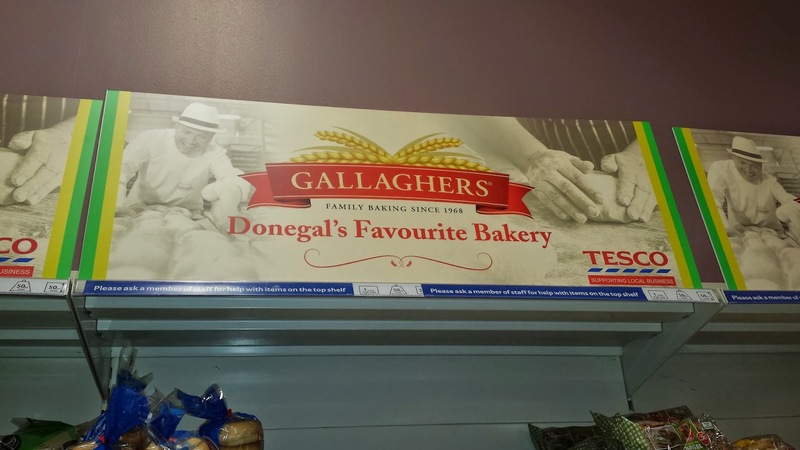 At Tesco, we found Gallagher's bread, so we bought some to make sandwiches for lunch the next day. We also bought a variety of Irish snackfood to bring along as we browsed the grocery store. We walked back up the hill to the hotel and had half pints at The Central Bar before calling it a night. We woke up on September 21st planning to eat breakfast at our hotel, but we learned that they offered a continental breakfast for a higher price than we were willing to pay. Instead we walked down the street to an O'Briens and had bagel sandwiches for less money. After breakfast, we headed back to the hotel and checked out. We caught the Air Coach back to the airport to pick up our rental car. Our car was pretty banged up, and as we later discovered, had only one working headlight. So we took our sad car and headed northwest toward County Donegal. The plan was to go to Newgrange on the way up there. We stopped and learned that all of the tours were booked for a couple hours. While I was really hoping to do the tour, we had a long drive in front of us, so we opted to just check out the Visitors Center and walk around a bit instead. 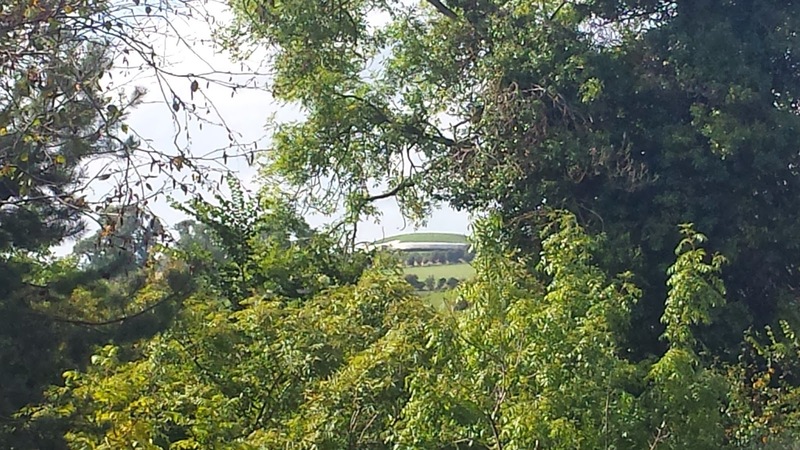 There was some nice scenery outside, and we even caught a glimpse of Newgrange. There were some people canoeing down this river. It was a lovely day outside and it was such a nice place to walk around. See Newgrange in the center? Before heading out, we signed up for a sweepstakes to win tickets to be present in Newgrange on the winter solstice. I don't think we won. We continued northwest until reaching Monaghan. We stopped here and walked around in search of lunch. The big GAA final between Donegal and Kerry (my family's two counties of origin) was on, so everyone was pretty preoccupied with that. The only real restaurant we found was a pricier looking place with big meals. Instead we popped into a Chinese takeaway and ordered szechuan chicken. We took our lunch outside and sat on some steps to eat. It was spicy! We stopped into Tesco before moving on, and bought some snacks. We also picked up an umbrella. We couldn't find our mini umbrella when we were leaving our house, so we thought we'd just pick one up when we arrived. However, the weather was so warm and beautiful all week in England that we hadn't had need of one until the rainy deluge the night we arrived in Ireland. Moving on with our biscuits and Tayto, we continued on northwest. We discovered at some point that our route to Donegal took us through Northern Ireland. We were somewhat surprised that there was no border check, and it was somewhat difficult to even tell where the border was on either side. We drove up through County Tyrone and attempted to stop at a Visitors Center when we saw a sign for one, but we couldn't actually find it. We parked nonetheless and looked around a bit in Omagh. (I later read that this was the location of a deadly car bombing during the Troubles). After walking around for a bit, we continued on toward Letterkenny. This was around the time we discovered that only one headlight worked, so we were hoping to get in before dark if possible. 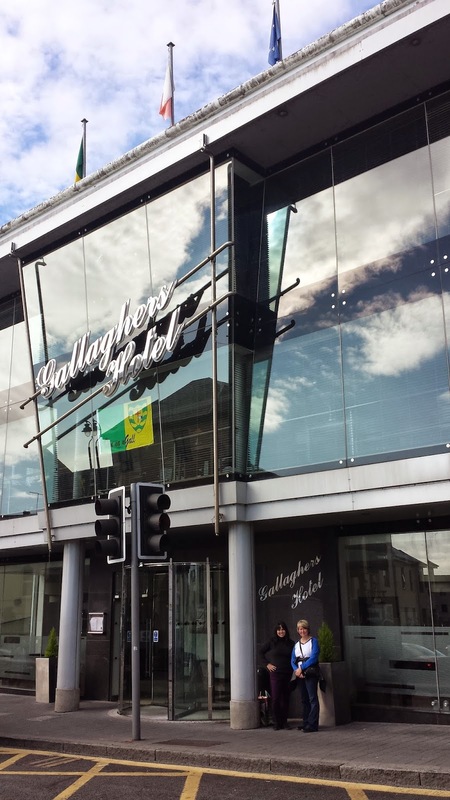 We arrived in Letterkenny and found Gallagher's Hotel. The guys worked on parking the car while Karen and I checked into our rooms. We walked out into the night to find dinner. Donegal had lost the GAA final earlier in the afternoon, but we saw a lot of people still wearing their gear. There were also green and gold Donegal flags and banners hanging everywhere. 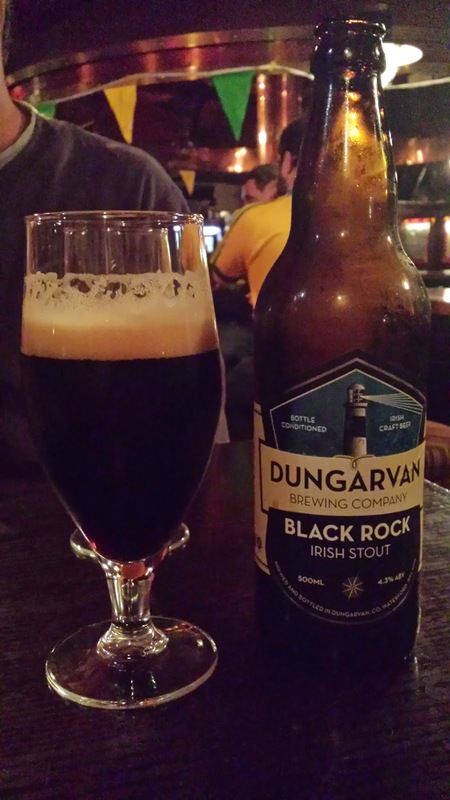 We found a place called Brewery Bar and Restaurant with a selection of craft beers. I couldn't pass up the salt & chili squid as an appetizer (squid is one of my favorite foods) so we split the Guinness beef pie for our main dish. It was a nice low key dinner, which we enjoyed after the hustle and bustle of Dublin. We headed back to the hotel bar for a nightcap before bed. We looked up ideas for what to do the next day over our drinks.